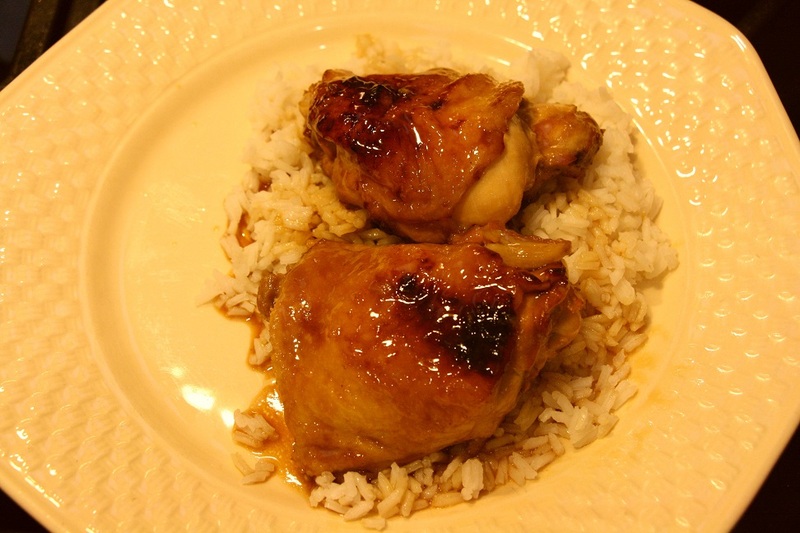 I have been wanting to cook something with Asian flavors but not the normal stir fry and when Pam posted the recipe for Chicken Adobo on her For The Love Of Cooking Blog, I knew it would fit the bill. Please check her site for some great shots of the dish. 1. Combine the seasoned rice vinegar, coconut milk, soy sauce, 12 cloves of garlic, 3 chilies, 3 bay leaves, and black pepper together in a large zip lock bag. Mix until very well combined. 2. Add the chicken thighs and seal. Refrigerate for at least 2 hours (I marinated for 3 hours). 3. Remove the chicken from the refrigerator 30 minutes prior to cooking. 5. 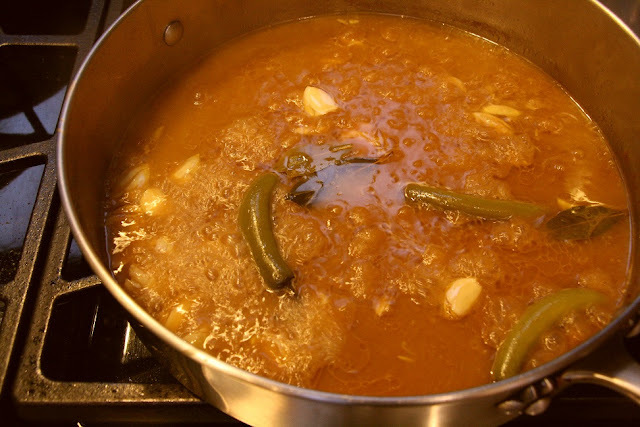 Reduce the heat immediately to a simmer and cook, stirring occasionally, until the chicken is cooked though and tender, about 30 minutes. (Since my sauce wasn’t very deep, I flipped the chicken after 15 minutes and added a lid then pulled it at 175F). 6. Remove the chicken from the sauce and place on a baking sheet. 7. Raise the heat under the sauce pot and boil until the sauce reduces down until it's the consistency of cream, about 15 minutes. Remove the bay leaves and chilies. 8. Place the oven rack near the top of the oven and turn the broiler on. 9. Place the baking sheet into the oven and brown the chicken for 5 to 7 minutes, or until they are starting to caramelize. 10. Remove, turn the chicken, baste with the sauce and repeat, 3-4 minutes more. 11. 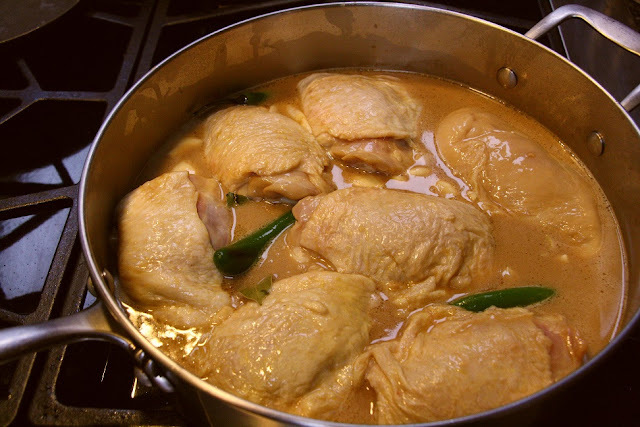 Remove the chicken from the oven and place back into the sauce on the stove and cook for a few minutes more on medium low. 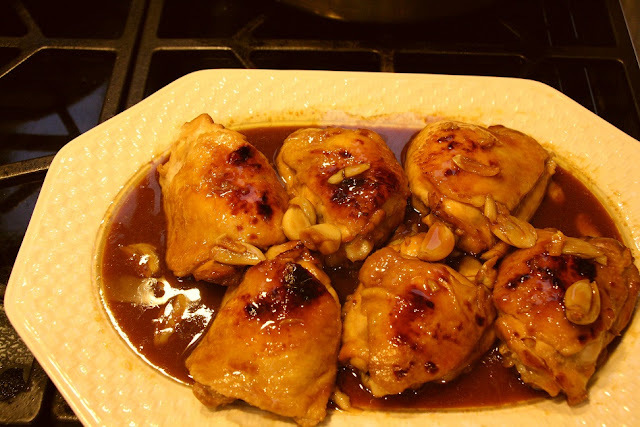 12.Place the chicken on a platter and drizzle with the sauce and the softened garlic cloves. We served it over rice but forgot to buy cilantro. We all enjoyed the moist and tender chicken and thought the sauce was very tasty although a little sweet for Bev, and the serranos provided just enough heat for the non-heat eating Cindy and enough that Bev and I knew it was there. Thanks for a excellent supper Pam – we know we can always count on your recipes, especially when given the thumbs up by your kids. During the meal we had a discussion about the word adobo trying to reconcile the name of this dish with the sauce that comes with Chipotles In Adobo. I did a little web research and turns out the word comes from the Phillipines where it is the cooking technique used with this dish. However, in Mexico it is sauce and in the Caribbean it is a spice such as Goya Adobo Seasoning - I always feel better when the fog clears. I LOVE all the flavors going on in this dish - sounds terrific! Thank you for clearing the fog. I'm most familiar with the Mexican sauce, so was surprised to see it used in the same sentence as Asian. This recipe sounds fantastic and I need to try it. As far as I'm concerned thighs are the best part of the chicken. I clicked over to Pam's site and she indicates this is a NYTimes recipe - always reliable. Oh, I am so glad you liked it. I was craving it last week so it's on the menu for tomorrow. Great shots!